Elizabeth Taylor (bor n 27 February, 1932), the legendary actress, acclaimed as one of the most beautiful women of her time. Eight marriages, admirers - millionaires, many men at her feet. But magnificent Elizabeth Taylor always appreciated the unselfish love that only dogs can give. Legendary screen beauty with sapphire eyes, recently turned 78 years old, but this does not prevent her from staying afloat, despite the numerous health problems. From the age of 72 Elizabeth Taylor is forced to spend most of her time in bed on the insistence of the doctors and to keep a very strict diet. Her bones became so fragile that once she earned a break, just because she stretched for something. Elizabeth has been married eight times, twice - for Richard Burton. And since 1996, after she divorced her seventh husband - Larry Fortenski - she was spending time in the company of her beloved Maltese named Sugar. The little white Maltese was accompanying Elizabeth Teylor to all public events and even appeared with her on the famous talk show of Larry King. It is rumored that Elizabeth Taylor was very attached to her dog. In an interview with American magazine «W» the actress said that she was quite happy with her husbands Ted and Barton, but now she is quite satisfied by the company of her lapdog. "I've never been so fond of dogs in my life. Sometimes Sugar seems to me very similar to humans. And her love for me is unconditional." When Sugar died in 2005, the actress bought her descendant - another Maltese, which is called Daisy. And once again there is a story of mutual affection and genuine love. Just like it was with Sugar before, Elizabeth Taylor takes Daisy at the social events. The glorious beauty is giving her autographs without letting the dog out of her hands. 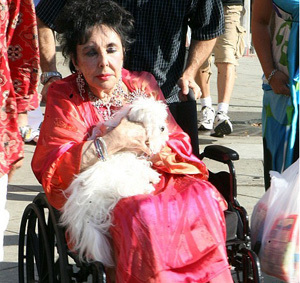 Although Elizabeth Taylor is now moving mostly in a wheelchair, her smile is still charming, especially when the beloved Daisy is in her arms.